The Cold War – Redux (Duplicity). Ukraine Part 6. Where does my story start? I felt the only way to find the answer to that was to go to the very melting pot that could turn the Cool War, into a Hot War, the Ukraine. I have made three trips so far, and the next few Posts will relate my experiences while there. Cold War Redux (Duplicity), Is due out on 23 March 2016. Back to Kiev again. It is a city I could never tire of visiting. One thing is for certain, they are passionate about their country. But there were always the reminders of the violence during the Ukrainian revolution in 2014. But the next day it was time to head south again and journey to the port city of Mariupol. My train would take me from Kiev to Zaporizhia (550km – 7 hours), then I would travel by car to Mariupol (250km – 3-4 hours). The alternative was via a non-express train straight to Mariupol. A direct route was not possible as the direct line ran through the Occupied territories of Donetsk, Donbass. So, the alternative route would take in the region of 22 hours. Tightly packed, no air-conditioning and facilities that are character building. Above is one of the many stations I passed during my journey. I eventually arrived at Zaporizhia, next was the 4 hour road journey. My journey by road would take me through the four fixed check points. But the Border Guard Regiment’s also set up random checkpoints, to catch any unsuspecting terrorists. The journey to Mariupol would skirt the occupied area of Donetsk, hence the heightened security. Security was exceptionally tight, my English passport always raising eyebrows and requiring considerable explanation from my escorts. This trip though, I was actually going to meet one of their colonels, a commanding officer a Border Guard Regiment. It was good to be back in Mariupol again. Mariupol is a large industrial port city on the shores of The Sea of Azov, a population of nearly half a million. The ethnic population is equally split between Russian and Ukrainian. The coast to the south. This is referenced in my new novel, Cold War Redux – Duplicity. Within an hour of being in Mariupol, I quickly spotted a number of OSCE vehicles. The Organisation for Security and Co-operation in Europe (OSCE) is the worlds largest security-oriented intergovernmental organisation. Their mandate covers issues such as arms control, promotion of human rights, freedom of the press and fair elections. They are currently monitoring the ceasefire in Ukraine, although neutral, they have been accused of a Russian bias. I did track down their compound, and although they are not armed, they do have some lightly armoured vehicles should they be required to go close to a conflict zone. I also spotted the occasional UNHCR vehicle. Pavlo, one of my escorts, and a good friend, then took me on a tour of the city. This road led to the battered city police headquarters. The building is adjacent to two roads and as you can see, it is currently derelict. Pro-Russian separatists attempted to take over the police station on the 9 May, 2014. They were unsuccessful. Up to 60 Pro-Russian separatists were alleged to have attacked the city police headquarters. They took over a couple of the floors, but the National Guard and other security forces were dispatched and quickly assaulted the station in order to reoccupy it. During the clash between the security forces, which included the Omega unit of the National Guard. Twenty+ militants were killed and a number were captured. But during the clash, the building caught fire and was soon completely gutted. I had half a day to myself, so I had another target I wanted to seek out. The two vehicles above gave me an indicator that I was on the right track. The next day was another visit to a military unit. This time the Border Guard Regiment based in Mariupol. I had secured a night-vision device and two high quality pairs of binoculars for the unit, which they were pleased to accept. The soldier I am handing the NVD to, is a Colonel, the commanding officer of the regiment . The sentry was happy to pose for a photograph. The regiment was responsible for preventing a number of ministers fleeing the country via airports during 2014. President Yanukovych was forced to flee the country by other means as a consequence of their vigilance. As ever, my reception was positive and I was always made welcome. The next course was significantly better. But there was no time to rest on my laurels. It had been arranged for me to meet up with the parachute brigade based in Mariupol. As ever, I came bearing gifts. Ten full sets of British Army MTP combats. Trousers, shirts and combat jackets. British Army MTP uniforms are a prized possession for the Ukrainian paras. Their hospitality, as ever, was second to none. Although they live a spartan life, their morale is extremely high. Weapons were always close at hand. Every soldier was equipped with an excellent first, first aid kit. The guys out on exercise. The soldier on the left had his birthday yesterday :). My friends also made sure I was well entertained. Pablo on the right and Athina on the left. And last, but far from least. My good friend Egor. We discovered that we were, at the height of the Cold War in the 80s, on opposite sides of the fence. Igor as a Captain in the Soviet Airforce in the 80’s. At that time, we were sworn enemies. Now, we are sworn friends. Don’t forget, Cold War Redux – Duplicity, due out on 23rd March. The Cold War – Redux (Duplicity). Ukraine Part 5. Where does my story start? I felt the only way to find the answer to that was to go to the very melting pot that could turn the Cool War, into a Hot War, the Ukraine. I have made two trips so far, and the next few Posts will relate my experiences while there. Now it was time to head south. This photo of Kiev Railway station was taken during daylight hours, but i needed to get to the station for 0600. Although the building was constructed between 1868-1870, inside is very modern. Information regarding train times was ready available. I actually booked my ticket for the Express Train online. Then with a printed copy, I could just board the train where it would be scanned by the conductor. There was a kiosk specifically for the use by servicemen and women of the Ukrainian Army/Military. My train, the one on the left, was the Express, and would take me from Kiev to Zaporizhia (550km – 7 hours), then by car to Mariupol (250km – 3-4 hours). The alternative was a train, like the one on the right, to Mariupol. A direct route was not possible as the direct line ran through the Occupied territories of Donetsk, Donbass. So, the alternative route would take in the region of 22 hours. Tightly packed, no air-conditioning and facilities that are character building. When researching the history of WW2 and the Invasion of the Soviet Union, coverage often referred to the flat open ground the armoured forces had to cross. This type of open ground was clearly evident during my 7 hour journey. We stopped at a half a dozen stations on the way and it was common place to see troops going on, or returning from, Leave. After a 7 hour trip, I eventually arrive at Zaporizhia. This city is located in south-eastern Ukraine and lies along the banks of the Dnieper River. I was met by my new found friend, Pavlo, second from the right. As the captain of a merchant ship, he is currently sailing somewhere in the region of Trinidad. I met the rest of the group, members of a political party wanting to move away from the Soviet style of government to one more suitable for a modern Ukraine, once in Mariupol. Afina, the one holding the poster, has also become a good friend. My chariot to take me from Zaporizhia to Mariupol. We had to pass through four checkpoints on the way. Security was very tight, particularly around the region of Donetsk Donbass, which was occupied by the DPR, Donetsk Peoples Republic, Pro-Russian Separatists, and Russian soldiers/mercenaries. The checkpoints are manned by a mixture of the Ukrainian Army, Volunteers and the Border Guard force. The soldier on the right with the green beret is from a Border Guard Regiment. On my next trip, I met the Colonel in command of the Border Guard Regiment stationed in Mariupol. They checked ID cards, passports and often searched the inside or boot of the vehicle. Bunkers and slalom system was in place to control traffic. They were particularly interested in my British Passport. I also had a stamp in my passport from my trip to Crimea a few years ago. Most of the soldiers were armed with AK-74s. This picture was from a later trip, when temperatures dropped to between -14 and -30 degrees. Heavier firepower, as seen with this BTR-80 and its 14.5mm KPVT machine gun, was never far away. I wasn’t able to meet my other newfound friend, Jarick, as he was on his honeymoon. That was a tug-of-war I was never going to win. 🙂 But, I was well looked after by his father, Igor. We first took a trip to where the volunteer battalion get some of their equipment. I purchased the battalion pairs of boots and various items of uniform. On my next two trips, I brought the items from the UK, in bulging suitcases. Any British MTP kit was always a favourite. Although Ukrainian combat trousers, shirts and jackets were slowly being distributed, the quality was far inferior to that of the kit from the UK/US. Igor then took me to meet up with a policeman from a SWAT team, so I could ask questions about the role he fulfilled in Mariupol. The policeman on the door was far from happy with me being there, but a quick word from Igor, who appeared to be a very influential person in Mariupol, and he quickly disappeared. So, I got my photo-shoot. The police station was also guarded by Ukrainian Army volunteers. The reason why will become more apparent when I cover the next trip I made. I finally get to meet Egor, yes, another Egor. He not only fought in the initial conflict during the uprising and Invasion in eastern Ukraine, but he is also a member of an elite SWAT team. The following day, it was time to meet up with the Volunteer battalion, who were on the front line protecting the eastern area of Mariupol. A Russian Ural 375 and a Gaz 66, some of the transport they used to move around the front line. They were incredibly receptive to my visit and welcomed me with open arms. As you can see, they wore an eclectic mix of uniforms. I had brought them some boots and additional British Army desert camouflaged shirts and combat trousers. They were very dependant on support from the local Ukrainian population for most of their supplies. At this time, July 2015, the Ukrainian Army was still recovering from what was in some circumstances a Russian supported civil war. The Ukrainian Army were still consolidating their forces and their associated logistics, so resupply was still in short supply. Even though they were dependant on external supplies to support their operation, the volunteer soldiers still found the resources to collect for the local orphaned children. These, if my memory serves me right, were tins of powdered milk. I am sure a Ukrainian speaker can read what’s on the box and put me right. This is Pavel, ‘The Bear’. On my next trip, I brought him a full set of MTP combats. Trousers, shirt and combat jacket. This was Pavel’s favourite toy, a ZPU-1, 14.5mm ant-aircraft single gun. It was great to spend some time with them and listen to their stories. They were on the front line to defend their city and their country and the majority had not been away from the front line for at least 6 months. Next week I will cover my second trip to Mariupol. Regardless of the fight along the border with Russia, the Ukrainian Defence Industry is still targeting overseas customers with a range of defence products. One of those is the Kvitnyk-E. The Kvitnyk-E, laser guided projectile (LGP) alongside a standard, smaller, (grey) 152mm round. The Kvitnyk-E has been developed by the Progress Scientific Industrial Complex and has been specifically been designed to be fired from the 152mm towed and self-propelled artillery systems, the 2S3 and 2S19. The LGP is not a replacement for the conventional 152mm high-explosive round, which is predominantly used for suppressive fire. The laser seeker is mounted in the nose with a fragmenation-type warhead along with 8kg of high-explosive. Although the LGP was accepted into service with the Ukrainian Army in 2012, full scale production has not yet started. The Kvitnyk-E would primarily be used for high value targets, such as command posts, bridges, artillery rocket systems, tanks and IFVs. Once the LGP has been launched, four fins will unfold at the rear of the projectile and four control surfaces will unfold at the front. The maximum range is expected to be in the region of 20,000 metres. But, Ukrainian industry isn’t stopping just there. 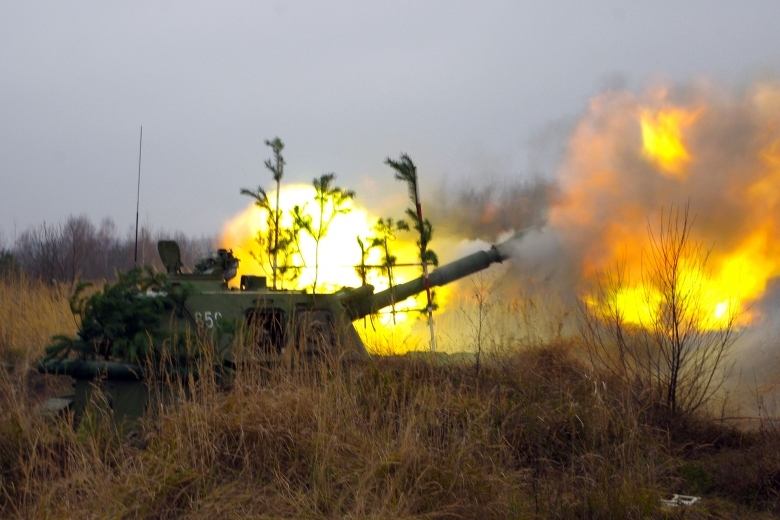 An LGP that can be fired from the more widely used Western artillery systems, such as the M109, a 155mm calibre weapon, is being marketed. Although this weapon does offer greater accuracy and target selectivity, careful coordination would be required between the weapons platform and the forward observer and designator. The FO would have to have line-of-sight of the target.